We’ve been enjoying the “Hey girl.” meme for quite a while. Ryan is just so dreamy when he talks library cards, feminism, homebirth, and homeschooling to us. But something was missing. Say hello to Real Food Ryan Gosling and Gluten Free Ryan Gosling. This post is part of Freaky Friday, Fight Back Friday, Sunday School, Seasonal Celebration Sunday, Monday Mania, , Make Your Own Monday, Make Ahead Monday, Made From Scratch Mondays, The Weekend Gourmet, Slightly Indulgent Tuesday, Allergy Free Wednesday, Frugal Days, Sustainable Ways, Healthy 2day Wednesdays, Real Food Wednesday, Gluten Free Wednesdays, , Simple Lives Thursday, Pennywise Platter Thursday, Full Plate Thursday. 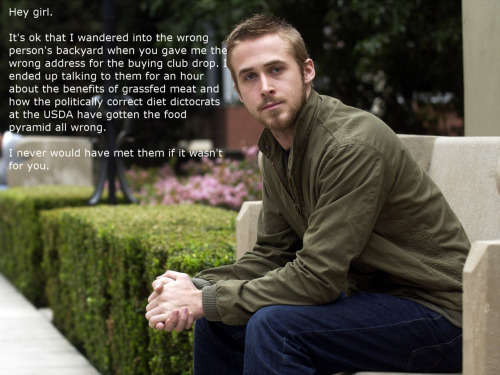 Oh dear, that picture for Gluten-Free Ryan Gosling is great. These are absolutely killing me! LOVE the tumblr pages! OMG! I so love this! Thanks for making my smile so huge today!! LOL!! We MUST be Portlanders….this is SO Portland to me, I love it! Isn’t that the truth! We embrace how silly we are. Have you seen the “Dream of the 1890’s is Alive in Portland” skit yet? It’s so us. Thank you so much for sharing this recipe at allergy-free wednesdays! You’re crackin’ me up! Wow! That was definitely different lol. Thanks for sharing on ‘Made From Scratch’ Monday! This is so funny! 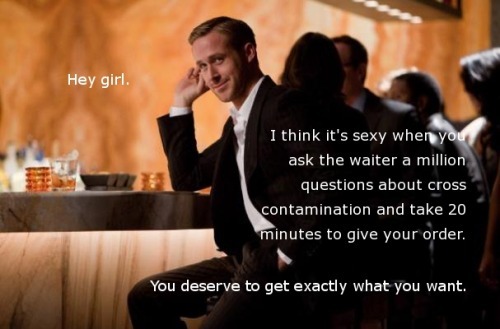 I’m not sure where “Hey girl” Ryan Gosling came from, but I get a big kick out of it! Those are so great! Especially loved all the real food ones! This is a great post, I just love it! Hope you have a wonderful week and Special Valentine’s Day. Thank you so much for sharing with Full Plate Thursday. I have only recently started seeing this “Hey Girl” meme, I think I saw it on Pinterest. Every time I see one they just crack me up. BAHAHA! Who started this Hey Girl, Ryan Gosling thing anyway? I wonder if he’s seen them and what he thinks about them.